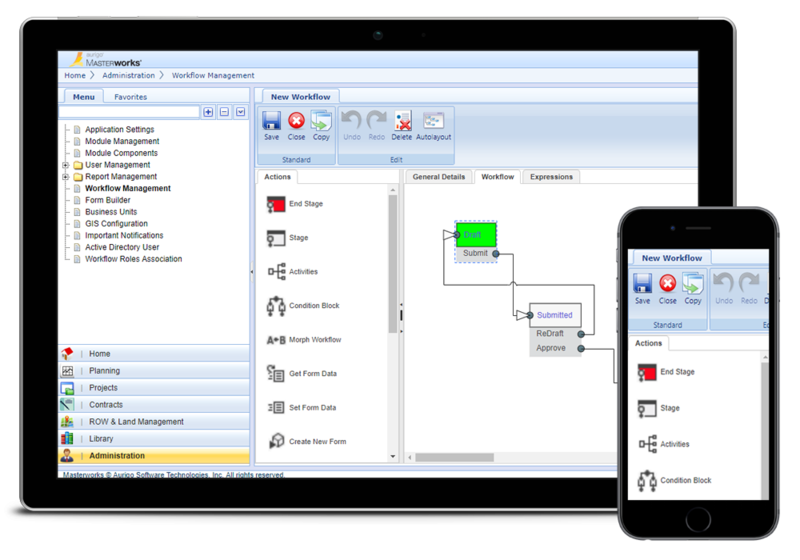 All products in the Aurigo Masterworks Cloud suite are built on the Masterworks Cloud Platform. The Masterworks Cloud Platform runs on AWS with the highest level of security, including SSAE-16 Type II. When you purchase any Aurigo product, you get the full power, security, and control of the Masterworks Cloud Platform. Our software is hosted on AWS with the highest levels of security certification, including SSAE-16 Type II. Aurigo Masterworks Cloud products can be used by both internal and external stakeholders. Our granular security and permissions model lets you control who can see and update each type of information. Aurigo works nicely within your existing IT environment and can integrate with your other systems via our open API. We support real-time, two-way data integrations, as well as batch transfers and data processing. Our Configuration Toolkit makes it easy to update any screen, form, workflow or report in Aurigo. Don’t want to do it yourself? We also provide Concierge Services and are happy to make the updates for you. The following Masterworks Cloud Platform capabilities can be used across any of the products in the Aurigo Masterworks Cloud Suite. The business of capital planning, construction and maintenance requires you to save detailed documentation at every stage of the project lifecycle. From approvals, certifications and contracts through designs, schematics and inspections, you need a system you can trust to store project information accurately and securely. The Aurigo Masterworks Platform has a robust document management functionality that supports the tracking, revisions and storage for all your important documents and workflows. Our powerful workflow and notification engine enables you to control and automate any process, form or document, including pay requests, milestones, change orders and more. Our Masterworks Cloud Platform comes out of the box with industry-standard workflows. Our default workflows can be used as is or configured for your specific needs. For each workflow, YOU decide what should happen, and modifying new workflows is simple. With Aurigo Masterworks’ business workflow engine, you’ll keep your business processes on schedule, your stakeholders alerted to their pending tasks, and your agency’s projects on track. 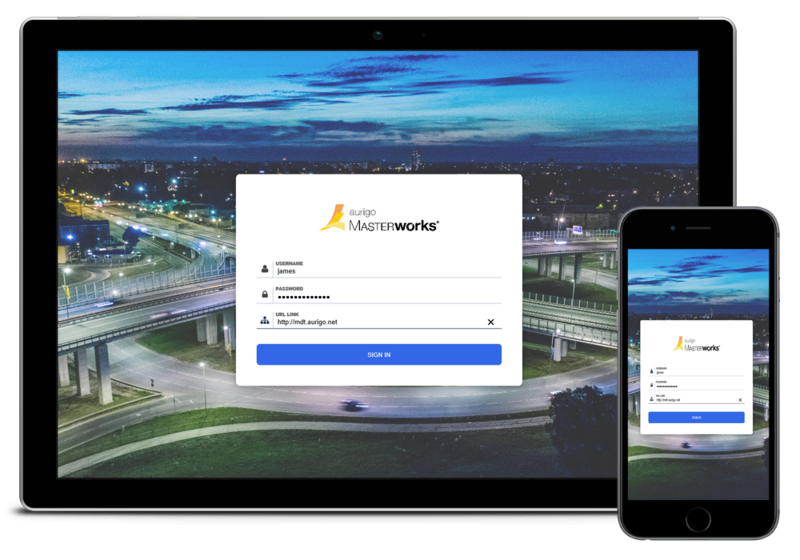 Aurigo Masterworks Cloud helps you stay in front of your projects by bringing real-time reporting to all your capital programs, construction and maintenance projects. With 300+ out-of-the-box, industry-standard reports and the ability to modify and create new reports, our powerful reporting engine gives you the crystal-clear visibility you need to stay informed and in control. Our dashboards give you visibility into the status, schedule, issues and details for every asset, parcel, test and project. Whether you want a snapshot at the portfolio level or a full analysis of an individual project, you get the answers you need from anywhere —even in the field on your mobile device. 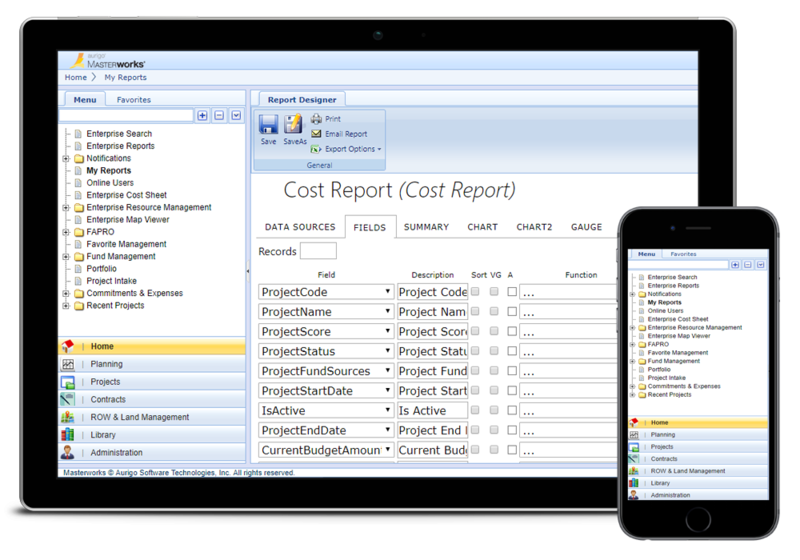 Export reports to PDF, Excel, Word, CSV, XML, etc. While the entire Aurigo suite of products can be viewed from any web browser or mobile device, we also have native mobile app capability for many of the products and forms most commonly used by people out in the field. 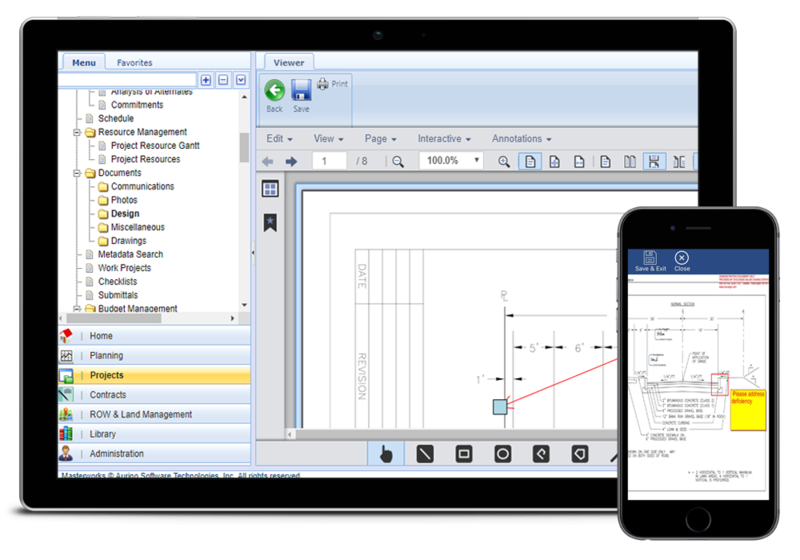 You can even decide to add new forms to the mobile application using our configuration toolkit.